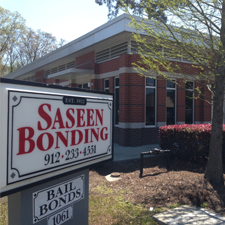 Saseen Bonding Company is Savannah Georgia’s oldest, family owned, and trusted provider of bail bonds. We offer three convenient locations throughout the greater Savannah area. The Savannah office is conveniently located just steps from the Chatham County Jail. For that reason, we offer fast and dependable service 24 hours a day. Consequently, our professional staff will guide you through the bail bond process in our friendly office. We provide exceptional confidential customer service; as a result our focus is ensuring you are informed of your upcoming court date. When you post bail bonds with Saseen, the defendant and indemnitor will receive court notices and phone notification from our office. For that reason, Saseen Bonding is staffed 24-hours a day to meet the needs of your busy schedule and life’s unexpected moments. Have a college student that needs a bail bond and the family is out of state? Saseen has you covered. Call Saseen and speak with a member of our staff and let us assist you in posting a bail bond for your family member. Because Saseen has offices located in Savannah and Statesboro we can assist Georgia Southern, SCAD, and Savannah State family members with posting bail bonds for their student. One mistake is bad enough, don’t make another by choosing a competitor. Choose the trustworthy professionals with a proven track record in bail bonds to assist you. We proudly service Bryan, Bulloch, Candler, Chatham, Effingham, Evans, Jenkins, and Screven counties. Call us today!